Feng shui offers useful tips in terms of boosting your chances of meeting your ideal partner, as well as improving the existing relationship. Before you make any feng shui changes in your home to maximise chances of finding your ideal partner or improving the existing relationship one important step needs to happen. You need to know exactly what you want. Your intention for the new relationship is very important. Feng shui = intention + energy + ritual. Writing down what kind of new relationship you want is critical for creating one. Write down your checklist, what you want and what you don’t want. Be as specific as possible (read the case studies below). This will help you establish criteria for your ideal relationship. Reviewing your previous relationships and noticing what didn’t work and why helps too. You don’t want to have a new relationship that is just an old relationship but with a new body. In relationships, history repeats itself very often – only with a new body. If you haven’t reflected on the previous relationships and learnt the lessons, there is a high chance that you’ll repeat it. Learn through wisdom, not experience (which usually is a very expensive teacher). Look at these visual representations below of the most basic types of relationships and establish what kind relationships did you have in the past and what kind do you want to have in the future. What kind of relationship do you have? What kind of relationship do you want to have? What kind of relationship don’t you want to have? Once you’ve established and written down (ideally by hand) what kind of relationship you want to have, it’s time to find a representation of it for your home. Find some brand new images, symbols, pictures, objects that will represent your new relationship. 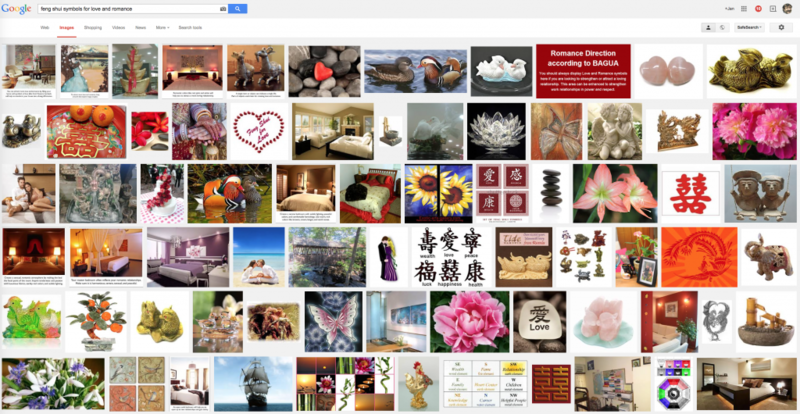 For ideas and examples, go online and search for images ‘feng shui symbols for love and romance’. Pick something that resonates with you. If nothing appeals to you, just get two nice red candles (don’t light them since candles cause air pollution) or two of something. Remember, your intention is the most important thing. The ritual is just a servant of your intention. Be positive and do it when you’re feeling inspired and happy (this is the energy part). Once you’ve found your unique symbol/s for your new relationship place it in your bedroom – ideally in your love/relationship/marriage corner which is the furthermost corner on the right from your bedroom door. If it’s not possible to place it there just place it anywhere in the bedroom that feels suitable. You can make a vision board if you have several images representing different aspects of your relationship and different values. The same applies here. Start fresh. Figure out what kind of relationship you have a the moment and what kind do you want to have in the future. On a piece of paper (on the left side) draw a simple diagram of the existing relationship (use the chart above for ideas) and then draw the one you want to have on the right side. In the middle, draw what needs to happen for the newly improved relationship to happen. Find a brand new symbol or image for the new relationship and place it in your bedroom. If you want to take your existing relationship to a new level – you need to do something new. A relationship is a process (not an event) and requires work. A good rule of thumb for a successful relationship is the 80/20 principle. If your relationship is 80% good, then that’s amazing. Always put anything that doesn’t work in your relationship into that 20% bracket, and you’ll feel much better (it’s sometimes called reframing). If you’re experiencing some communication problems – read Nonviolent Communication: a Language of Life Not all relationship problems are due to environmental or feng shui issues. Yes, feng shui can affect your health, mood, sleep patterns, and stress levels which as a result will affect your relationship but your relationship skills and emotional intelligence is more important. 1. Geopathic stress: if you’re sleeping over geopathic stress you won’t rest properly, and this will impact your health and your relationship. 3. No images or symbols of love or photos together: if your love and relationship are not represented in some ways in your home, this can have damaging effects. The more photos of you both together (having fun, etc.) the better and place them everywhere. If you’re single, avoid solitary images. 5. 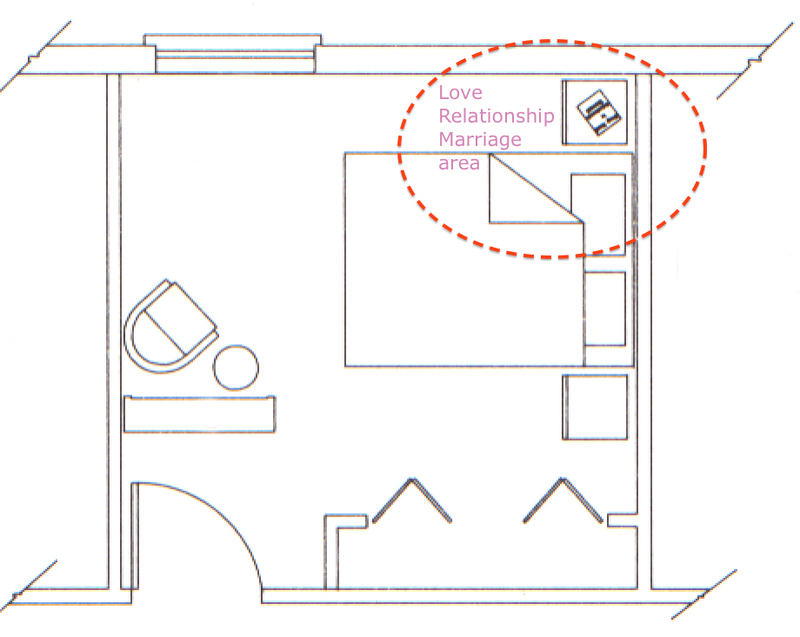 Relationship/love/marriage area: this is the furthermost area from a door to any room or house/flat. Check the state of your relationship corners. If they’re vibrant and not cluttered, the energy of love is available to you, and your home is working for you. If not, activate the love areas with light, flowers, appropriate images, and objects, etc. One of my feng shui clients wrote over 10 pages of what she wanted (and didn’t want) to have in her new relationship. When I read her checklist I was a bit doubtful if such a perfect man does exist at all on this planet, but we installed an extra large crystal in the love corner of her flat in London, UK and to my surprised she met her match (unbelievably almost 90% compatible) two weeks later on a business trip in the US. But the man lived in Australia. She forgot to put on her checklist that he would live in London. With some difficulty, she relocated to Australia. Remember: add your location to your checklist. Another client of mine called me and informed me that the checklist and feng shui rock. After completing her checklist and making some changes in her bedroom she met the man of her dreams who was 85% compatible. But in her case, she forgot to add the age to her checklist. He was 15 years older than her. (I’m not saying that relationships with an age difference can’t work, but this wasn’t what she wanted.) Remember: add an approximate age of your new partner. Research suggests that an ideal age difference is four years, either way. Obviously, there are exceptions where the age difference was greater, and the relationship worked. The lesson here is to be quite specific in terms of what you want and don’t want. Vegetarian, vegan or meat eater, smoker or non-smoker, wants to have kids or not, lives nearby, the same age, taller than me or not, etc., etc. All those factors are important. A lot of people have very unspecific criteria for a new partner (i.e. a nice person, good looking) which is not very helpful at all. It’s like going to a travel agent and trying to get a plane ticket without giving them the location, time, etc. Even if you had met your ideal partner, you’d probably not recognised them in the first place. Read the story of boats and helicopters – it will save you a lot of time. 1) Clarify what kind of new relationship you want to have and write it down as your checklist. 2) Improve the feng shui of your love corner in your home with appropriate symbols, images, etc. 3) Check that your bedroom is a healthy place to sleep. Improve the feng shui of your bedroom (see above). Switch off wifi for the night, etc. Posted in Feng shui for love and romance.